More vividly descriptive than ever before - into the brain through the eyes! Thanks to numerous photos and graphics with eureka moment, the German vocabulary and grammar will virtually remember themselves. The new visual method promotes the learning process and is great fun. 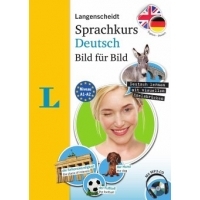 Langenscheidt is one of the most internationally renowned and leading publishers in the fields of Languages and Reference. Founded in 1856, the yellow brand stands for exceptional quality and expertise in the field of language learning.